Gustav Holst was closely involved with choral music throughout his career. As a schoolboy in Cheltenham he helped his father with music for church services and soon became a choirmaster himself at two Cotswold villages. He composed anthems and partsongs which won prizes in competitions organized by The Boy’s Own Paper, and then went to London to study at the Royal College of Music where he continued to write partsongs as exercises for Sir Charles Stanford’s composition classes. In 1896 his Light leaves whisper, to words by fellow-student Fritz Hart, won a prize offered by the Magpie Madrigal Society and was performed at Stafford House – his first important premiere. This was also Holst’s first published composition, and although it is in the conventional Victorian manner, with little trace of the individual character of his later works, it shows that he was developing his ability as a composer and could invent and handle contrasting musical materials with confidence. But his first real demonstration of skill in choral writing was the Ave Maria of 1900, an eight-part setting for double female chorus which evokes archaic styles without descending into pastiche, taking the cori spezzati of the Venetians as a model for the layout of the voices. Despite the evident influence of Verdi, a few personal touches such as unusual shifts of tonality, the use of seventh chords, and the piling up of contrapuntal entries give hints of Holst’s later mature style. He dedicated this moving and tender piece to the memory of his mother, who had died when he was only seven years old. Having earned his living as an orchestral musician for some years after leaving college, in 1904 Holst embarked on a new career as a schoolteacher, adapting his skills to the task of providing suitable music for his pupils. His first appointment was at James Allen’s Girls’ School in Dulwich, South London, for which he wrote settings of words from Tennyson’s The Princess – music which is interesting and effective, yet within the vocal capabilities of schoolgirl singers. Two of these settings include an additional ‘echo’ choir placed in an adjoining room, so that an intervening door could be gradually closed at the words ‘dying, dying …’, an early example of the fade-out which he later used so effectively at the end of The Planets. To this period also belongs the mixed-voice partsong In youth is pleasure to words by Robert Wever (1565), whose conventional writing suggests a ‘potboiler’ produced to supplement his earnings; or perhaps it was intended for one of the adult education evening classes which he taught at this time. During the early 1900s the rediscovery of English folksong by such collectors as Cecil Sharp, Ralph Vaughan Williams and Percy Grainger helped Holst to simplify his style and rid himself of the heavy legacy of the nineteenth century. He became interested in modal scales and flexible metres, which he realized were more appropriate to settings of the English language than the diatonic system and regular rhythms of the Germanic tradition. Vaughan Williams was also working on the music for the new English Hymnal during this period, and besides contributing some of the tunes himself Holst was intrigued by the simple beauty of the plainsong melodies which were included in the collection. These influences began to have an effect on his own music, especially when allied to medieval words, as is evident in such pieces as Jesu, Thou the Virgin-born (No 3 of the Four Old English Carols of 1907) and A Welcome Song (of similar date) with accompaniment for oboe and cello. Another interest of Holst’s in the early years of the century was Sanskrit literature, and he made several settings of his own translations of hymns from the Rig Veda for various combinations of voices. For the Two Eastern Pictures of 1911 for female voices and harp, he chose words from the Spring and Summer cantos of Kalidasa’s poem Ritsusamhara which describes the six seasons of the Indian year, following his usual method of making his own version of the words and then comparing his results against published translations, making any amendments which might be necessary. In 1913, while on a walking tour in Essex, Holst discovered the village of Thaxted with which he was to be associated for the rest of his life. Here he met the vicar, Conrad Noel, a medievalist whose enthusiasm for folk-dancing and church music affected all who came into contact with him. Holst had the idea of organizing a Whitsun festival there, bringing singers and players from St Paul’s Girls’ School and Morley College in London to join with local people in a weekend of musical festivities, and in 1916, once work on composing The Planets was finished, he was able to devote time to writing and arranging music especially for Thaxted. The carols Bring us in good ale (dedicated to Conrad Noel), Lullay my liking and Of one that is so fair and bright originated in this way, together with Terly, terlow which was given an accompaniment of oboe and cello to form a companion piece to the earlier Welcome Song. But his most outstanding achievement was This have I done for my true love (also dedicated to Noel), an evocation of the medieval notion of dancing and religious worship being closely intertwined. 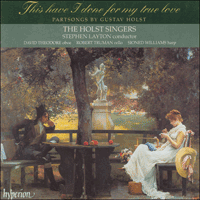 The melody of this piece is so lyrical, with a strongly modal character, that many people thought that Holst had used a genuine English folksong, but in fact it was his own. Although he had made several folksong settings during the pre-War years, at Thaxted his interest revived and he made settings such as Diverus and Lazarus for the festivals and also arranged folksongs for other performers. When his friend W G Whittaker asked for some new music for his Newcastle choir in 1916, Holst hesitated at first, and then some ideas for folksong settings came into his head, resulting in the Six Choral Folksongs, of which the first three are dedicated to Whittaker and the remainder to Charles Kennedy Scott and the Oriana Madrigal Society. He chose five of the melodies from the collections of George B Gardiner and one from Baring-Gould’s Songs of the West. In these arrangements Holst demonstrated his skill in producing a variety of solutions to the problem of how to retain musical interest during several repetitions of a strophic melody, but he later felt that he had virtually exhausted the medium. ‘It’s a limited form of art’, he wrote; ‘when one works so long in a small form mannerisms are almost inevitable.’ He therefore turned to larger-scale choral works such as The Hymn of Jesus and the First Choral Symphony, and operas such as The Perfect Fool and At the Boar’s Head, together with various instrumental and orchestral works. During the 1920s his stature as a composer increased rapidly because of the widespread popularity of The Planets, and he was often invited to musical events in various parts of the country. One of these was at Aberystwyth where Adrian Boult introduced him to the sisters Gwendoline and Margaret Davies, discreet patrons of the arts and other worthwhile causes. Musical weekends at their house at Gregynog attracted many well-known musicians, and in 1930 Adrian Boult asked Ralph Vaughan Williams to make some choral arrangements of Welsh folksongs especially for Gregynog. Because Vaughan Williams was busy with other projects he turned the task over to Holst, who made twelve settings after listening to the singing of Mrs Dora Herbert-Jones. Although Holst’s settings were made on the basis of the English versions of the words which he had asked Steuart Wilson to prepare from Mrs Herbert-Jones’s translations, there is no doubt that the melodies are more effective with the original Welsh words, as is evident from the very opening rhythm of Mae ’nghariad i’n Fenws (‘My sweetheart’s like Venus’). Compared with the English folksongs of 1916, the style of this later set is generally more ‘Holstian’ – lean, sparse, with occasional dissonant harmonic clashes, while remaining firmly in keeping with the basic tonality of the songs. In 1933 Holst once again visited Gregynog for the first of the annual festivals which were to be held there, and he was so impressed by the singing of the choir that at the suggestion of Dora Herbert-Jones he wrote a composition especially for them. For his text he selected lines from the fourth Song of James Elroy Flecker’s poem The Gates of Damascus in which a traveller sets out on a journey of pilgrimage southwards across the desert towards the holy city. Holst’s setting, originally inscribed only with the dedication ‘For Gregynog’ but later known by the first phrase of its words O spiritual pilgrim, treats the journey as a metaphor of life itself, and ends with a quiet evocation of spiritual peace and reassurance. This short composition was to be the last choral work which Holst wrote, as he was already seriously ill. He died less than a year later following a major operation.